What do a classic roadster, diesel-powered crossover, and electric utility van have in common? In this instance, they all have a Nissan badge on their nose – Datsun makes a cameo appearance, too. The NY Daily News Autos drives two of Nissan’s hottest 2015 models, a few tempting European-market cars and trucks, and even classics like the original 240Z. Nissan has one of the fastest-evolving and diverse lineups in the auto world, with most products in showrooms having been redesigned or updated within the last five years. We recently tried out the most recent additions to the Nissan lineup, and had the rare opportunity to spend time with prototypes, classic cars, and products sold in markets outside the United States. We were among the first to officially drive the 2015 370Z Nismo, a track-oriented 370Z that unofficially debuted at an owners gathering in May. The ’15 model makes a 7-speed automatic available for the first time on a Z Nismo, and adds Recaro seats and some changes to the chassis tuning. We drove a Z Nismo equipped with a 6-speed manual and liked the balance of performance enhancements and drivability. (A GT-R, which we drove directly afterward, still felt like a mental, hair-raising machine by comparison.) It may not rival a classic Z car for future desirability, but the Nissan Z remains a great – and sometimes overlooked – choice in the sports car world. This was also our first drive of the Juke Nismo RS, a fantastic, performance-oriented treatment of the cheeky Juke crossover SUV. A 6-speed manual transmission, on-point steering feel, superb seats, and a surprising amount of turbo oomph make it as fun to drive as it is polarizing to view. Even if you think it looks like a giant frog, the Juke is still fantastically fun to drive. The Juke Nismo RS is proof that great things can come in small, strange-looking packages. It was surprising to see Nissan’s first electric van for mass production, the e-NV200, at this event. Based on the vehicle you know better as the Taxi of Tomorrow, the e-NV200 sources its batteries and motor from the Leaf hatchback, resulting in a silent delivery van with a range of about 100 miles. Its driving position and road manners are van-like, sure, but it accelerates well, and is much quieter than its gas-powered counterpart. The e-NV200 is currently being tested by FedEx, and any future commercial sales are likely to be limited to work fleets. The teeny-but-not-too-tiny Micra is sold in Canada and Mexico, where it competes with the Mitsubishi Mirage and Fiat 500 as basic urban transportation. It impressed us with its solid fit and finish, punchy 109-horsepower 4-cylinder engine, and high level of equipment. This is no GT-R – or even a Juke, for that matter – but there is merit in its small dimensions, frugal nature, and able chassis. More forbidden fruit materialized in the form of the Qashqai crossover SUV. Underneath the Qashqai (say cash-kie) is a U.S.-market Rogue, but this particular SUV was equipped with a torquey turbodiesel engine. Don’t hold your breath for that motor to make it here, however. We still like the Qashqai’s elegance, both in and out, and would forgive its slightly louder engine note for the greater returns in efficiency. Nissan fastidiously keeps running examples of its historic past, including the 1600 Fairlady Roadster seen here. Don’t be fooled by the Broadway-worthy name, because this little car is an absolute driving delight – Julie and Rex would almost definitely give it a standing ovation, in our opinion. The Fairlady is a light, tossable roadster that does a great impression of similarly small and charming British sports cars. Except unlike the British cars in the 1960s, the Nissan was absolutely reliable (sorry MG and Triumph fans). The Fairlady’s agility is impressive, even though it does without power steering. Once the exhaust’s overrun kicks in around 3000 rpm, you have no choice but to fall in love with this tiny Nissan roadster. The Fairlady got things rolling, but the original 240Z defined Nissan’s balance of style, performance, and budget-friendly pricing in the ‘70s. This particular 240Z was rehabbed by Nissan in 1996, as part of an official effort to breathe life into the Z brand, despite the temporary discontinuation of the car. That pricey restoration paid off, because this car is sublime to drive! The wooden steering wheel, slick shifter, light clutch action, and limber chassis make the 240Z as compelling to drive as many modern sports cars. In time, the Z packed on more luxury features, additional power, and extra pounds. The original is the best, and probably the Nissan we’d most like to take back home. As a point of love-it or hate-it styling, the Nissan Juke is king. As a weird, samurai-bullfrog-looking compact crossover with handling chops and a gutsy powertrain, it also has one of the bravest inclusions of a manual transmission in recent memory. It’s funky, unmistakable, polarizing and actually pretty neat. Okay, so even though the back seats have a surprising amount of legroom, it’s like sitting in a cave, and the sightlines out the back are challenging – every frog needs a few warts. But those matter less when the amphibian gets a big wet kiss from the Nismo princess. Enter the 2014 Juke Nismo RS. The Jukiest Juke, with many new bits to make looking at, driving, and being inside it a more exciting experience, is the top of the heap for the model line, positioned above the regular Juke Nismo. I put one through its paces in Nissan’s American homeland of Tennessee and came away with a few quick impressions. – I don’t care who knows it: I think this Nissan looks cool. The red highlights on the fascia, side skirts, mirrors and brakes pop. Styling changes advance the latent aggression already baked into the Juke. It looks meaner, more playful and confidently ridiculous. The bugeye headlights seem to work better with this front-end treatment and the always-on, low-mounted LED accents look great on the road. It goes without saying that this isn’t a car for everyone. -One of the great crimes of the turbo direct-injected era is an incomprehensible crusade against turbo whoosh. It’s delightfully present in the Nismo RS. This is a breathed-upon version of the standard 1.6-liter direct-injected, turbocharged four-cylinder. Most of the grunt comes through ECU tweaks, but there are upgraded connecting rods and a dual-mass flywheel for smoother revs. At 215 horsepower, It makes 27 hp over the standard Juke, and comes packed with 210 pound-feet of torque, a useful 33 lb-ft bonus over stock. (Of course, that’s only if you opt for front-wheel drive – AWD models reduce these numbers to 211 hp and 184 lb-ft). Strapped to it is an upgraded six-speed manual with a beefier clutch and housing, plus lower gear ratios for first through third. -This is a powertrain that requires full driver engagement for maximum performance. Turbo lag is real here, so keep on the juice, pick the right gear, and this Juke RS will punch far above its weight. Fall short and you’re stuck in no-boost-town, slowly pulling away from the stoplight. Do pay attention to drive mode though; Normal, Sport, and Eco have real effects on throttle response and steering effort. By the way, its EPA numbers are pegged at 25/31/27 miles per gallon, city/highway/combined. -My example was a front-wheel-drive, manual transmission model. This means it retains the torsion-beam axle of the standard Juke (all-wheel drive goes multi-link) and doesn’t get the inside-wheel-braking torque vectoring system of the AWD Nismo RS. There are a raft of other goodies though: chassis bracing, stiffer springs, more aggressive dampers, a lower ride height, recalibrated electric power steering, 0.9-inch bigger brakes up front and an upgrade to vented discs from drums at the back. Just-right 18-inch wheels wearing 225-width ContiSportContact5 summer tires round out the chassis goodies. – On the road and around a corner, this little beasty is indistinguishable from a classic hot hatch. Expect gobs of torque steer if you’re goofy with the throttle while twitching the steering wheel, but play it smart and the reward is prodigious cornering, snappy steering, predictable and progressive understeer limits and just a fun all-around character. The ride is much more our style too; the standard Juke can feel a touch too soft, this feels German – just enough road feel without punching you in the kidneys. -Nissan shows once again that it knows what it’s doing when designing a sporting manual transmission. Quick, notchy, great gear spread. We could row through those gates all day. – For the Juke’s interior, Nissan has given its Nismo team the good drugs. There is a stark difference when stepping from a base Juke into the Nismo RS. Rather than climbing into soft seats, you slide across rigid thigh bolsters and drop down into some of the most racecar-like Recaro chairs on the road right now. Nissan admits they eat up a healthy portion of the almost $7,000 premium over the base vehicle, but they’re worth it. Along with the suede seats, the Nismo RS has faux suede on the wheel, gauge hood, rear seats and door panels. The gauges are red. It’s neat. – The real-time digital torque gauge (and drive info in screen general) is placed down low on the center stack, well below the safe line of sight. It would be fun to see them dance around. A bit disappointing. – The most unfair part of our drive was being nowhere near a closed course or a racetrack. It feels like there’s a lot more to learn here, but not on public streets. A common practice on these kinds of drives is to play the pricing game. The Price is Right rules apply, he who gets closest without going over wins. With the 2014 Juke Nismo RS, almost everybody we spoke with went over. $30,000-32,000 was the price most pegged this little devil with, yet its base price is $26,120 and ours came in at $28,345 with options. That seems eye-watering when a basic Juke runs $19,170, but this is so different as to be barely recognizable. Against rivals like the Ford Fiesta ST (let alone larger, heavier cars like the Focus ST and Volkswagen Golf GTI), the Nismo RS costs a bit more. However, it has the higher seating position many customers prefer, plus a lot more visual chutzpah. The RS is by no means a perfectly behaved performer, but it’s a ton of fun, and that’s what really counts. Let’s all agree right off the bat that the 2013 Nissan Juke NISMO is not going to win any beauty contests. It will not be runner-up, and it will not collect $10. That’s just the reality when you look like a bullfrog that just returned from a month-long vacation in Chernobyl. But now that that’s out of the way, we can move on to more pressing topics. Such as the fact that the 2013 Juke NISMO is the undisputed champion of backing up its looks with performance. No car on the market today relies on being fun to drive to make up for its design more than the Juke, and the Juke NISMO goes far above and beyond the call of duty. Normally, I try to find a specific road trip or weekend cruise while testing cars, to put them in an environment and just observe how they react. There was no gameplan with the Nissan Juke NISMO, though, and it was quite fitting. Because I wanted to drive it everywhere and anywhere. I flew out my front door time and time again, giddy to take the Juke to the grocery store; or to daycare; or to work or to lunch or even just to the nearest traffic circle and back. Hey, I should go up this hill. Now I think I’ll go down the hill. Round this corner, round that one and that one and that one. I would have driven it up a curb and weaved through parking meters if I thought local law enforcement would share in my joy for the spunky crossover. Because the Juke NISMO is seriously fun. The short wheelbase (just 99.6 in), combined with improved power, handling and suspension all come together to create a high-octane front-wheel drive experience. Compared to the standard Nissan Juke, the direct injected, 1.6L turbo-four is bumped up from 188 horsepower to 197 and from 177 lb.-ft of torque to 184. That modest jump of 9 hp doesn’t seem like quite so much, but consider that it’s a 5-percent increase on a car that weighs under 3,200 lbs. and includes a jump in the turbocharger from 11.75psi to 13.05psi. It all adds up. NISMO, the Nissan skunkworks arm, tuned the electric power steering and increased the spring and dampening rates in the suspension to bring the whole package together. Interior touches include NISMO sport bucket seats that grip your love handles and hold on tight, and red stitching accents plus an Alcantara trim on the steering wheel complete the pumped-up look. It is just the right amount of testosterone without going overboard, much like the car itself. The all-wheel drive version has torque vectoring which makes it sound positively delicious, but that model only comes with a continuously variable transmission (CVT). Consider that the front-wheel drive doesn’t have a sporty differential, but does comes standard with a great six-speed manual attached to a satisfying leather-wrapped knob. Besides, while the Juke NISMO has that extra power and a new front splitter that Nissan claims does wonders for downforce, you probably aren’t taking your Juke to the track. Unless you really need the AWD for weather purposes, stick to the FWD model with the manual and a price tag of just $22,990 MSRP, and rest assured your inner hoon will be plenty satisfied. Predictably, back seat space is tight and rear cargo is limited, but if you’re looking for a practical crossover then you probably didn’t click on this article in the first place. Nissan has the Rogue (test drive article here) and the new 2015 Murano for that. A jogging stroller fit into the Juke’s rear hatchback space, but just barely. The rear seats do fold down in a 60/40 split if that works for you. All in all, the Nissan Juke NISMO is one of the more enjoyable cars for the money that I’ve driven in a long time. Its satisfying connection through the six-speed manual and potent but steady boost from the turbocharger make for a very engaging drive. Fuel economy hovered around the low end of its 25/31 MPG rating, but at highway speed it does reach 30 MPG and above without trouble. There is also a Juke NISMO RS version available for about an extra $3,000, and at 215 hp and 210 lb.-ft there is a discernible difference. It also gets better brakes and additional tuning to the steering and suspension. Either way, you can’t really go wrong, though some reviews say the NISMO RS turns things up a tad higher than is suitable for the Juke. The fact of the matter is, though, if you don’t mind standing out in a crowd and want to have fun doing it, the Nissan Juke NISMO is a hell of a ride – even if it’s not quite pageant worthy. 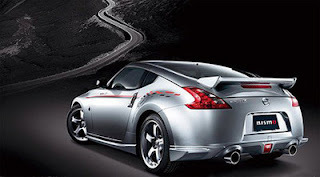 I happened upon a picture of the forthcoming 370Z. Notice the NISMO kit on it! I’m unsure if this is an actual photograph or an artist rendition. Like everything else I’m sure this is just the beginning and we’ll be seeing more details in the future.